A new year already? Craziness. Did you make it up til midnight to ring in the new year? Because, um, I most definitely did not. I welcomed my bed around 10:30pm. No regrets! Bed > Champagne. I have a 12 week old, after all. Undoubtedly, 2014 has big shoes to fill. The highlight of my year was, of course, the birth of my daughter, Shea. But the year was full of lots of goodness – a trip to Cabo, good health, great beach weather, success at work, and another year spent documenting my culinary adventures (and life’s randomness) on this little blog. It’s hard to believe this blog is 5 1/2 years young. Time flies when you’re having fun spreading the word of healthy food tasting great, I guess! Be sure to check out my 14 most favorite recipes of 2014, as well as my Pinterest, Instagram, and Facebook pages for inspiration and recipes. There’s also these little things called cookbooks that I have a history with. My second cookbook, Prevention RD’s Cooking and Baking with Almond Flour, was published in August of 2014. It was a labor of love and an accomplishment I am so very proud of. My gluten-loving self fell in love with gluten-free goodness, and head-over-heels for almond flour. However, some recipes are naturally gluten-free…like this one. And some recipes just so happen to be vegetarian and vegan (that is, of course, if you can resist the sprinkling of Parmesan cheese…unlike me). 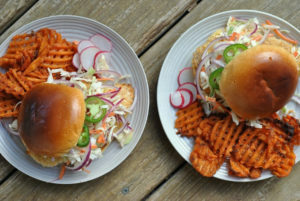 And sometimes, when all of our lucky stars align, recipes that are super healthy, gluten-free, and vegetarian/vegan are also reeeeeeeeeally tasty. Not just like, “Hmmm…that was okay” tasty, but like “WHOA BABY” tasty. 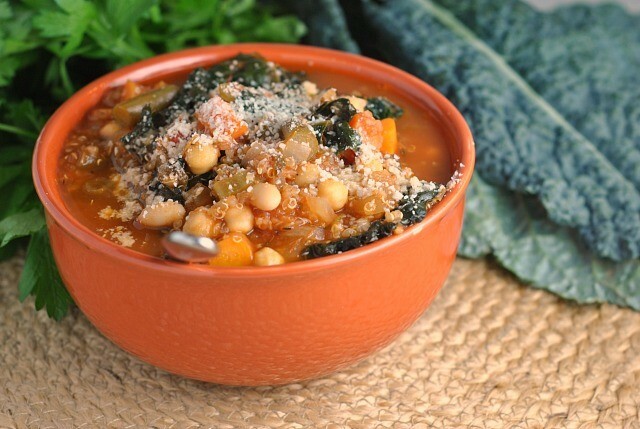 So, on this 1st day of 2015, I bring you a gluten-free, vegan WHOA BABY recipe to enjoy. It also happens to be a bowl of pure comfort for this cold front rolling in. We are anticipating waking up to snow tomorrow, and seeing as this is Michigan and it is January, I really can’t complain. Just pass me the soup! In a large stockpot, heat olive oil over medium-high heat. Add diced onion, carrots and celery and saute about 5 minutes, until softened. Add green beans and peas and saute 2 minutes; add garlic and cook 1 minute longer, or until fragrant. Add in broth, crushed tomatoes, water, parsley, rosemary, thyme, granulated sugar, season with pepper to taste and bring mixture to a boil, then reduce heat to medium and allow soup to gently boil, uncovered for about 20 minutes. Add quinoa, stir, cover and cook 15 - 20 minutes longer. Add beans, kale, and lemon juice and cook, uncovered, until kale has wilted, about 5 minutes. Serve soup hot and garnished with Parmesan cheese, if desired. Question: Is there anything you’d love to see more of, less or, or new on PreventionRD.com? « Top 14 Recipes of 2014! I sure wish I had a bowl of that wonderful soup right now–for breakfast. 🙂 Always looking for ways to incorporate quinoa. This looks like a winner. Happy New Year Nicole! 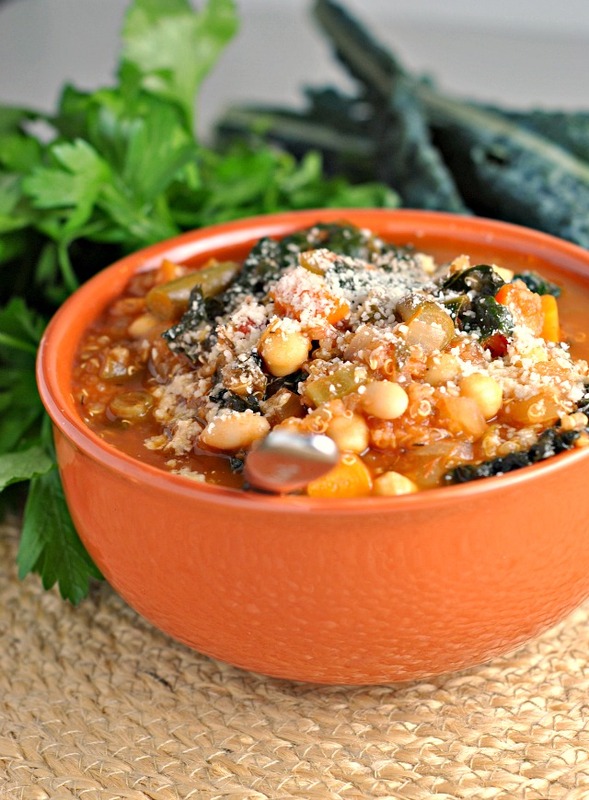 This recipe looks great, and I look forward to more wonderful healthy eats from you in 2015! I love how healthy this soup is but still totally satisfying. 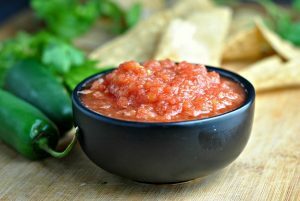 It is a meal in a bowl and perfect for Winter. 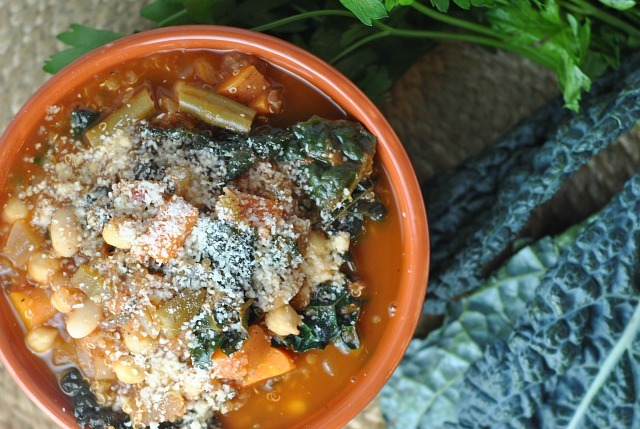 I looooove minestrone, and really love how you incorporated quinoa (and touch of lemon juice) into this classic! Cheers to 2015! I love kale, and that it can be thrown almost in anything to green it up! 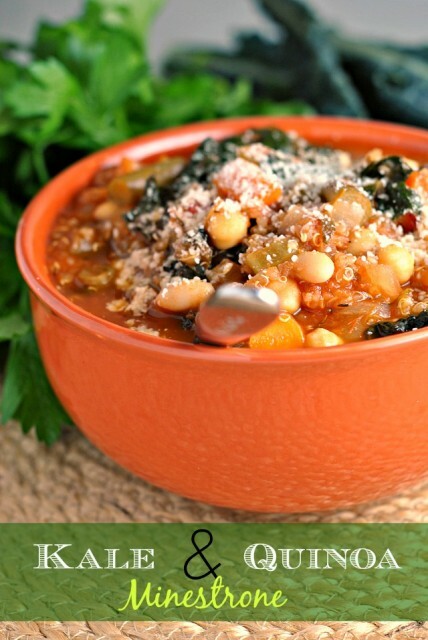 This soup sounds great, and can’t wait to try it one of these chilly winter days! Happy New Year! This soup looks delicious. I love making soup all winter long, and I am a sucker for anything with kale in it. Can’t wait to try your recipe! This was a great soup! I almost forgot to add the lemon at the end, but so glad I remembered. It was subtle, but a great addition. Adaptations: I excluded the sugar, used all broth (no water) and I didn’t have fresh parsley. Whenever I see a bowl like this, I’m always so attracted I end up buying ingredients for soups only. I usually forget purchasing things for other meals.